The claimants’ primary argument was that the new fee limit would have a chilling effect on the ability of those from disadvantaged social backgrounds to take up university places. For this reason, they contended, the decision to increase the fee cap breached the right to education conferred by Article 2 of Protocol 1 to the European Convention on Human Rights, or alternatively breached Article 2 Protocol 1 read with Article 14 of the Convention. The Court was not persuaded. Delivering the main judgment of the Court with which King J agreed, Elias LJ recalled the findings of Lord Browne’s 2010 review into University funding which formed the basis of the new scheme, and noted the various provisions in the scheme which were designed to widen access, including loans, grants and scholarships. As regards Article 2 Protocol 1, his lordship held that absent discrimination, it would take a very exceptional case before it could be said that the charging of fees in itself violates the education right, at least where loans are available to those who need them. Of particular note in this part of the Court’s judgment is its dismissal of the claimants’ reliance on Article 13(2)(c) of the International Covenant on Economic Social and Cultural Rights, which provides that higher education shall be made equally accessible to all by every appropriate means and in particular by the progressive introduction of free education. It was in fact noted that the Committee on Economic, Social and Cultural Rights, which monitors compliance with the Convention, has expressed concern that the introduction of tuition fees in the UK appears to be inconsistent with the Covenant. Elias LJ, whilst acknowledging that the Convent must be taken into consideration in the appropriate case, held that Article 13(2)(c) of the Convent was not binding and that in any event, the progressive introduction of education was not an absolute obligation but depended on the resources available. The claimants’ second ground of challenge was that the decision to increase the fee cap was made in breach of the public sector equality duties, which broadly require public authorities to give due regard, in carrying out their functions, to the need to promote equality of opportunity for protected groups. It would take a brave person indeed to envy the Court its task in a case such as this. 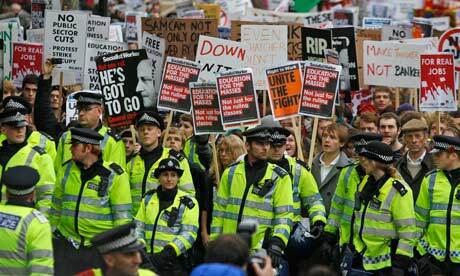 The government’s decision to increase the tuition fee cap has been a deeply controversial and polarising one, culminating as it did in a string of occasionally violent mass protests. This, in the context of the financial crisis, makes for an extremely difficult factual matrix within which to pronounce on legal rights and duties. In reaching its decision, the Court was clearly very mindful of that factual matrix and the implications of its judgment. Its concern to ensure that it did not stray into the domain of policy-making is, Lord Sumption reminds us, appropriate and, Sir Stephen adds, customary. Especially so, one might add, in a case and at a time such as this. One does, however, come away from the judgment with a renewed sense that the extent to which an analysis of legal rights and duties should be framed in a consideration of political implications and deference to the executive is an issue which is worthy of much reflection. More practically, the decision is line with the cautious approach that has generally characterised decisions on challenges to the Government’s spending cuts (see our blogs on these). It demonstrates that in the absence of clear violations, such challenges would continue to face an uphill struggle. But I still recommend going to other EU countries to study. They are much cheaper, the universities are at least as good, often better, and you’ll pick up another language.